Sleep scientists are raging against blue light, the specific wavelength emitted by our smartphones, computers, tablets and even some Kindles. As you know from this blog, blue-enriched light is an enemy of sleep. Research has shown that exposure to this specific color of light can delay sleep time by as much as one hour, maybe more. Although all wavelengths of light suppress melatonin production (which helps you sleep), the pineal gland is particularly sensitive to light in the blue range (460-480 nanometers) but the opposite is also true. Blue light makes people feel energized and awake. That's why sleep experts suggest turning off your devices several hours before you hit the sack. If that's not possible, if you must read your Kindle in bed or check Facebook on your tablet while getting ready for sleep, the next best thing is to cut back on the blue light they emit. There are several ways to do this. In an article published in frontiers in Public Health titled Bigger, Brighter, Bluer-Better? Current light-emitting devices – adverse sleep properties and preventative strategies the authors tested two methods to reduce the blue. You can try both of them on yourself. First, software. The authors tested an app called f.lux which promises to help reduce the blue light. The app developers claim the program "makes the color of your computer's display adapt to the time of day, warm at night and like sunlight during the day. It's even possible that you're staying up too late because of your computer. You could use f.lux because it makes you sleep better, or you could just use it just because it makes your computer look better." The download is free. 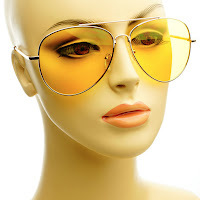 Second, the researchers tested orange-tinted 'blue-blocking' glasses. These are available from Amazon and elsewhere. This also work to cut the blue. The authors of the study pronounced that "Both the orange-tinted glasses and the 'sleep-aware' app significantly reduced short-wavelength emissions." While the glasses and app reduced blue light, the researchers did not study their effect on actually helping people get to sleep. It was not part of this study. The authors noted that testing would be challenging because there are so many other environmental factors that keep people from getting a good night's sleep. As for helping the most people, they cite a study from the National Sleep Foundation’s Sleep in America Poll suggesting that nine out of ten American used a technological device in the hour before bed. With so many people using these devices, large-scale public health interventions would be expensive and difficult to implement. A much better approach, they say, is for manufacturers to offer hardware with an automatic 'bedtime mode,' that shifts blue and green light emissions to yellow and red as well as reduce backlight and light intensity during evening hours. They add: "Ideally future software design could be better optimized when night-time use is anticipated, and hardware should allow an automatic 'bedtime mode' that shifts blue and green light emissions to yellow and red as well as reduce backlight/light intensity." In the meantime, have you tried either of these fixes – the blue light-reducing app or yellow-tinted glasses? If so, let us know about it. Good sleep is essential for optimal health .. The more time we spend on our iPhones, iPads, or Kindle Fires – all devices which emit blue light – the harder it is to get a good night’s rest. Do Pets in the Bedroom Help You Sleep Better?